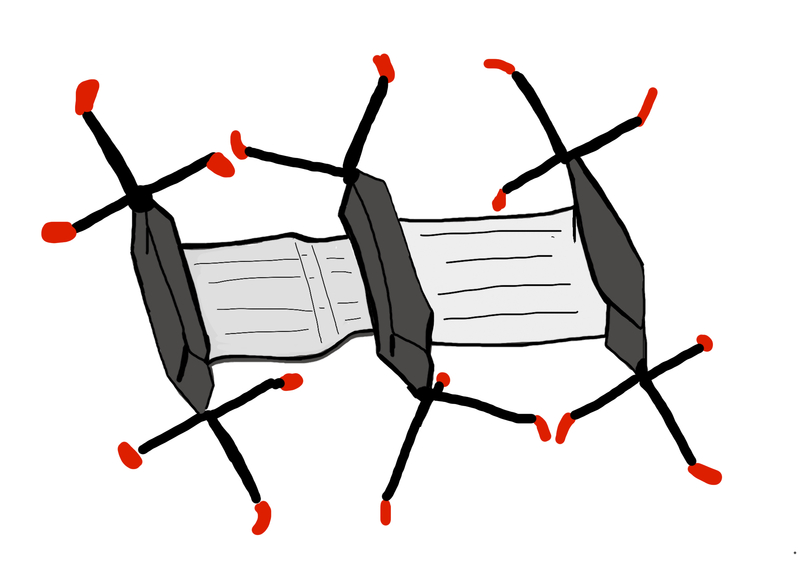 A history of insect-inspired walking robots and how they “evolved”. Earlier this year our Department of Entomology at the University of Illinois at Urbana-Champaign hosted the 3oth Annual Insect Fear Film Festival. This year’s theme was InsX-files and combined two “alternative” communities – those passionate about insects and those passionate about a TV show that has not been on the air for years, the X-files. You might be surprised to learn that even in the Midwest these communities can fill up a big lecture hall no problem (I was). 30th Insect Fear Film Festival Promotional Design (Theme: Ins-X Files). Designed by Joseph Wong for Illinois’ EGSA. One of those episodes, entitled: “War of the Coprophages” (1996), was shown at the festival. This particular episode has achieved cult status here at Illinois because it features the character Bambi Berenbaum, who in her appearance and mannerisms is exactly like nothing like our fierce leader and Department Head May Berenbaum. (Morgan consulted various books authored by May and thus decided to give the fictional USDA scientist a name that honored her). Another reason why I love this episode (besides the fact that it is basically a fantastic piece of suspenseful science fiction writing) is that it featured insect-inspired robots. In short, a town somewhere gets overrun with cockroaches that may be killing people. Some of the roaches appear to be mechanical rather than biological. Agent Mulder decides to visit a researcher named Ivanov at the Massachusetts Institute of Robotics to get a better idea about what engineers are up to. IVANOV:For decades, my colleagues in artificial intelligence have attempted to create an autonomous robot. By struggling to give their machines a human-like brain, they have failed. A human brain is too complex, too computational. It thinks too much. But insects merely react. I used insects as my model, not just in design but by giving them the simplest of computer programs. “Go to the object. Go away from the moving object.” Governed only by sensors and reflex responses, they take on the behavior of intelligent, living beings. MULDER: So this one is just programmed to head towards any object moving within the field of its sensors? MULDER: Then why is it following me? MULDER: Your contract is with NASA? IVANOV: The goal is to transport a fleet of robots to another planet and allow them to navigate the terrain with more intricacy than any space probe has done before. It, it sounds slightly fantastic, but the only obstacle I can foresee is devising a renewable energy source. In any case, this is the future of space exploration. It does not include living entities. Screenshots from the X-files episode “War of the Coprophages” showing two of the insect-inspired robots featured in the episode. Darin Morgan could have gleaned inspiration from another University of Illinois Entomology Faculty member for ideas about robots, namely Fred Delcomyn who around 1996 was also working on a cockroach-inspired robot. Instead the Ivanov character is clearly based on MIT’s Rodney Brooks, a roboticist who, at the time, wanted to move away from incorporating Artificial Intelligence into robots and instead conceived of robots that were more adaptive to their environment. By programming only simple modules of behavior into the robot, rather than complex reasoning parameters, and let the robot thus react to the environment, Brooks felt that he could build some very functional robots. Much like the ones featured in the X-files episode. Brooks’ mid-nineties robot is named Genghis (~1991). Genghis was the first robot created by the iRobot Corporation (now of Roomba fame) and was intended for possible planetary exploration. Other insect-inspired robots from Brook’s MIT “Insect Lab” includes Boadicea which employs a differential leg design to allow for longer stride frequencies and an increase in speed (the cockroach Blaberus discoidalis served as the model). Both Genghis and Boadicea are robust to failures in leg function, much like animals that can adopt a compensatory gait. Choosing robustness over perfection is a characteristic that shows up again and again in successful bioinspired robot design. Around the same time that Genghis became famous other research groups in the United States also started building walking robots that incorporated the biomechanics of actual terrestrially locomoting insects. I review some of the more successful projects here. Why build robots based on insects? Insects exhibit behaviors that are considered relatively simple, and thus easier to emulate. The resulting behavi0r may appear complex or purposeful to the observer but it is actually derived from fairly simple rules on how the nervous system perceives environmental inputs and how an internal “neural” pattern generator relays this information to “external” mechanical components (muscle, legs). Of course, “simple” is relative. Different situations may also result in different behaviors (and neural input). For instance, when cockroaches are close to wall they tend to amble, at this speed the animal is very sensitive to nervous feedback from its surroundings, each individual leg is more sensitive to this feedback. When roaches trot really fast across open spaces then a central pattern generator may “suffice”. This CPG generates rhythmic movements in a neural circuit, with little feedback from the environment. Another goal of roboticists has always been to miniaturize their creation. Making cheap little robots is still the goal. Smaller robots can potentially survey areas that are currently not accessible. Also, if you have multiple smaller robots available then you can send more to one area, each carrying cameras and chemical sensors, while a robustness (missing or non-functioning individual robots) is built into the system. As we shall see, miniaturizing brings its own challenges. Insects are small, some insects live in social groups, so there is lots to learn about miniaturization and swarming from them. It is also much easier to make a robot that has an exoskeleton that is segmented (rather than an animatron that has an endoskeleton). 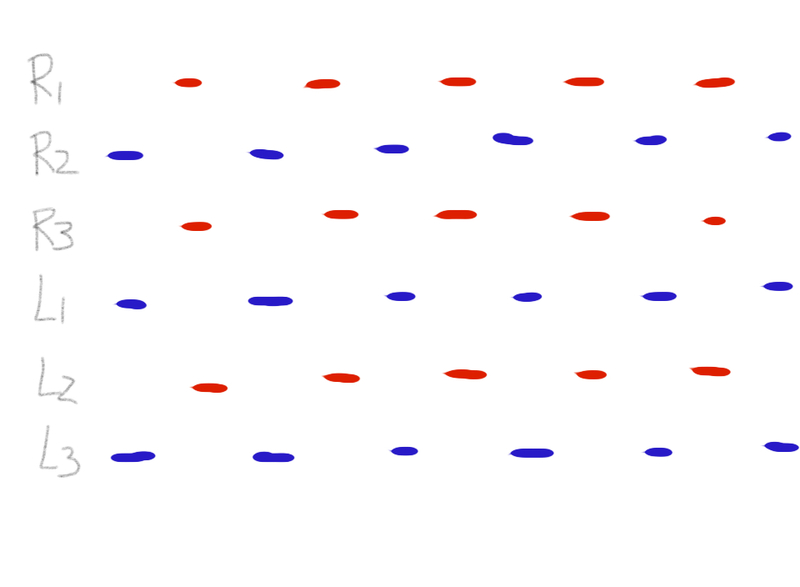 Insects are segmented animals and in some of the insect-inspired robots we see this segmentation too because it increases flexibility. Since the 1996 episode of the X-files many other insect-inspired walking robots have spawned. Even evolved. 1. RHex – Robotic Hexapod. Terrestrial animals (bipeds, quadrupeds, hexapeds, octopeds) all rely on a spring-mass system where the limbs (incl. muscle and cuticle) have a spring-like function to help support the animal’s weight over the course of the stride (larger animals have stiffer springs). In addition, the neural control of muscle action during walking and running is linked to muscle stiffness and thus the spring. The biological data was then used by engineers Dan Koditschek (at the University of Pennsylvania), Al Rizzi (Carnegie Mellon University) and Martin Buehler (then at Boston Dynamics) to build a robust autonomous robot that was able to transverse uneven ground without actual terrain sensing or actively trying to control adaptive maneuvers. Despite the fact that RHex legs have many degrees of freedom (many legs, joints and actuators), by incorporating real biological data and following the simple rules of a spring-mass system a robot was created that is quick (as measured in body lengths per second), maneuverable, and robust. And very recently it was announced that RHex is also able to leap. There is also a a cost-efficient education and research version called EduBot. (For some great pictures and video of RHex click on this Boston Dynamics website). For an explanation on how you can use biological research (by Joe Spagna and others) done with RHex in your college courses and outreach project click here. Whereas I have always found RHex to have a spunky personality the robot Sprawl to me seemed to have something sinister about it. Must be because of all the wires and (pink!) tubing. Of course, some of the more “evolved” versions have names such as Franken-Sprawl or Sprawlita which does not help them win cuddliest-robot contests. The Sprawl family of robots were created by Mark Cutkosky‘s group at Standford University’s Center for Design Research, again using data from Berkeley’s Polypedal lab. The Sprawl robot incorporates biological principles not only in its leg arrangement and design, but also in its construction and in the material properties of its structure. The robot was made using (then) modern manufacturing techniques (shape deposition manufacturing) to create limbs of the right shape and with the desired material properties, like stiffness at certain critical points. 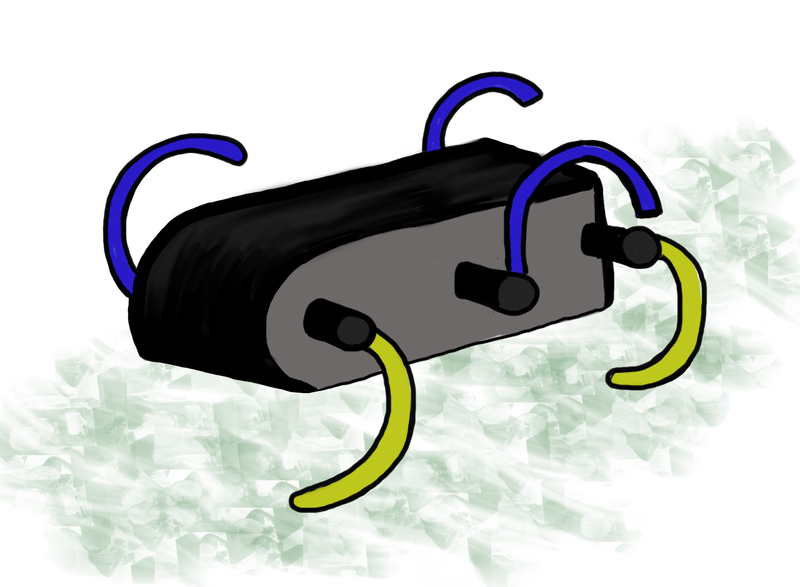 Early Sprawl robots used pneumatic actuators, whereas the later iSprawl robots used electric motors and flexible cable drives. 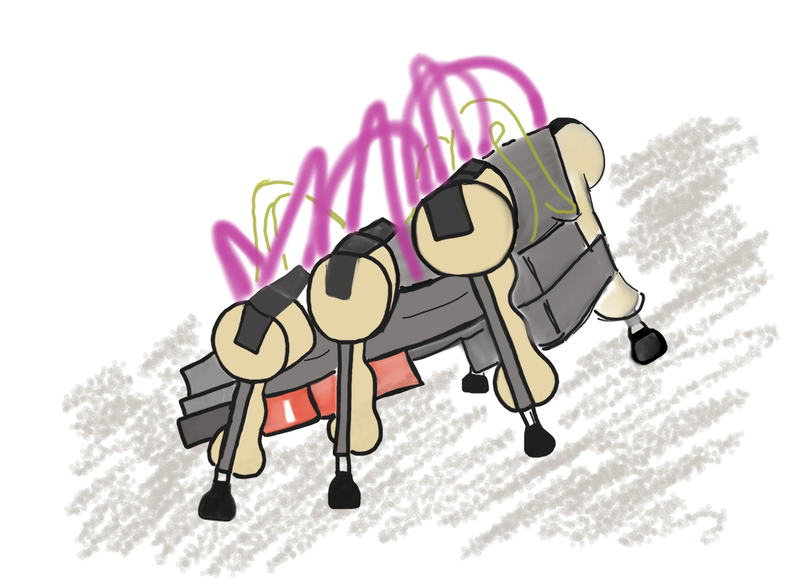 The final result is a sturdy and super-fast robot that resembles a scurrying cockroach. Over the years Sprawl (now called Sprawlettes) have become smaller and smaller (currently you can hold one in the palm of your hand) and they can now be batch-manufactured. Another successful collaboration between biologists and robotocists can be found at Case Western Reserve University. Since the 1990s Mechanical Engineer Roger Quinn’s group has used data from neuroscientists such as Roy Ritzman to build cockroach-inspired robots that can walk and climb (for instance, the hexapod Robot III from ~1999). One line of robots is the WHEGs family of robots which use a Wheel-Leg hybrid. The robot was inspired by the European Space Agency’s Prolero robot and RHex, but instead of using 6 motors to drive individual legs (as RHex has) it only uses one powerful one, which can distribute its power to all or just a few of the legs. The later models of Whegs mimic cockroach maneuverability to manage uneven surfaces. In addition, cockroach behavior during locomotion is copied by adding a variety of sensors. Cockroach rely on antennae to guide them over and under obstacles. Whegs robots are fitted with mechanical antennae that mimic the movements of the cockroach antennae and to help the robot “make decisions” about the best way forward. Locomotion beyond walking and running. Rapid inversion like cockroaches and geckos do to get under ledges. Also, check out my pinterest board on robots inspired by nature. One area where we can also still learn from insects, and which in my mind has been somewhat ignored, is the fact that insects can recycle large parts of their exoskeleton...maybe this can become a focus too. I will explain more about the beauty of the materials that make up the insects exoskeleton in one of my next few blog posts. Until then, all you need to remember about this post is that “The truth is out there”. ← I did not do it first. I really loved this post!I want to watch the episode again!